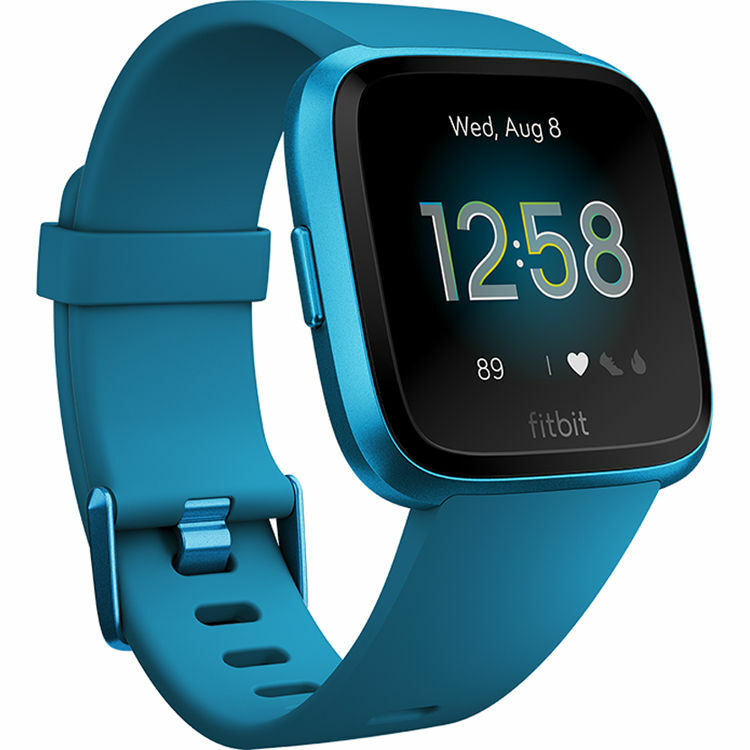 The Versa Lite Edition Smartwatch from Fitbit is designed to be your assistant, your companion, and your coach. Keeping tabs of your fitness and health statuses and goals, bringing you up to date with notifications and reminders, and doing it all while you're awake and asleep. All of the sensors, features, and capabilities of the Versa Lite Edition is packed into a compact, slim, and lightweight anodized aluminum body. You interface with the Versa via its single-button design and touchscreen, which features up to 1000 nits of brightness and durable Corning Gorilla Glass 3 material. When it comes to fitness and health, the Versa Lite Edition works in conjunction with your smartphone to provide real-time pace and distance, while supporting over 15 different types of workouts. You can even use it in the pool thanks to its 50m of water resistance. The Versa Lite Edition can also track basic activity stats like steps, active minutes, and calories burned. Whether active or not, your health is monitored via continuous PurePulse heart rate monitoring and sleep tracking. During your day-to-day responsibilities, the Versa Lite Edition is there to give you call, calendar, text, and app alerts. You can even send quick replies to text when paired with an Android device. You also get access to helpful apps without needing to take out your phone. Everything from checking on the weather, sports scores, and more. The built-in battery takes care of all of these functions and more for up to 4+ days without needing a recharge, and its wireless technology lets you synch with (optional) Bluetooth headphones, and hundreds of iOS, Android, or Windows devices. PurePulse Heart Rate: Continuous heart rate tracking. You can follow trends over time and see real-time heart rate zones. Sleep Tracking: See how much time you spend in light, deep, or REM sleep during the night. Female Health: Log your periods, track your cycle, and gauge ovulation. Cardio Fitness Level: Receive a Cardio Fitness Score and tips on how to improve your cardio health over time. Remember to Move: Receive friendly reminders to stay active throughout the day. Activity Tracking: See steps, distance, calories burned, and how many minutes you're active. Exercise Modesv: Track specific workouts with 15+ exercise modes. Also, use your phone's GPS to see real-time pace & distance covered. SmartTrack: The Versa Lite Edition automatically recognizes and records runs, sports, and aerobic workouts when you start them. Swimproof: From sweat, rain, or doing laps, the 50m water resistance can withstand it all. Fitbit Today: A central location to see your daily stats, personalized insights and reminders. Guided Breathing: Stay calm throughout the day with personalized breathing sessions based on your current heart rate. Apps: Instantly access a variety of apps, such as weather, sports, and more. Notifications: Receive notifications while your phone stays in your pocket. Get alerts from calls, calendar, text, and apps. Quick Replies (Android Only): Send quick text replies straight from the Versa Lite Edition. Multi-Day Battery: Enjoy 4+ days of continuous battery life. Memory (Motion): Saves 7 days of detailed, minute-by-minute, motion data. Memory (Daily): Saves daily totals for the past 30 days. Memory (Heart Rate): Stores heart rate data at 1 second intervals during exercise tracking, and at 5 second intervals at all other times. Box Dimensions (LxWxH) 8.0 x 4.1 x 2.0"